CONSERVATIONISTS HAVE RAISED concerns over the scale of the plastic pollution problem on the Skellig islands off the coast of Kerry. 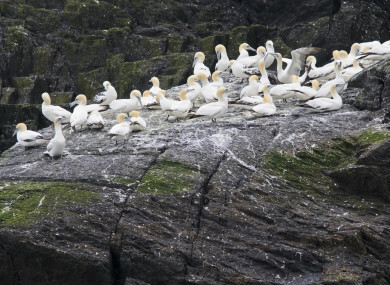 Birdwatch Ireland says that the 70,000 or so gannets of Little Skellig have been using plastic waste material, rather than seaweed, to build their nests. This is of particular concern as seaweed that the birds would normally use is biodegradable and rots away over time, but the plastic materials remain. Stephen Newton, Senior Conservation Officer of Birdwatch Ireland, said the birds’ use of plastic has now “become obvious”. The gannets were using easily available floating plastic materials such as nylon fishing nets and polystyrene rope to help form nests for their chicks, he said. The National Parks and Wildlife Service said “it is apparent when approaching Little Skellig that gannets use plastic waste material when constructing their nest sites”. Newton said a beach focused clean-up plan needs to be “rolled out nationally” to raise awareness and highlighted research currently being undertaken at GMIT Mayo in marine studies with regard to plastics and wildlife. There are further environmental issues with micro-plastic that has been worn down by wave action being found in the diets of birds, chicks and fish. This plastic can appear to look like fish eggs to birds. If they ingest it it reduces the amount of room in their stomachs for real food. Newton explained that this is “quite a big issue” that results in the starvation and death of birds or chicks – as they are unable to digest the plastic contents. The National Parks and Wildlife Service said it did not have records of specific instances where birds have died as a result of ingesting or becoming trapped in plastic but “it has been shown to be an issue elsewhere in the species’ range and is a matter of concern”. Breeding seabirds are monitored through surveys carried out about every ten years and Stephen Newton spoke of seeing gannet chicks “throwing up their last meal” to reveal plastics within. Plastic was also causing problems with other species, he said, including seals who have been spotted with “necklaces” of plastics, which can remain on animals for years. The National Parks and Wildlife Service said it “deplores and strongly condemns the dumping of waste anywhere in our natural habitats, and is looking into this matter”. Little Skellig is home to the second largest gannet colony in the world. The gannet is Ireland’s largest seabird. Email “Gannets on Little Skellig are using plastic to build their nests ”. Feedback on “Gannets on Little Skellig are using plastic to build their nests ”.